Buckhead Heritage’s work toward the rehabilitation of Harmony Grove Cemetery, located at the southwest corner of West Paces Ferry and Chatham roads, was awarded the 2009 Preservation Award for Excellence in Rehabilitation by the Georgia Trust for Historic Preservation. Information on this extensive preservation work, plus links to additional research and articles, can be found here. The first documented burial at Harmony Grove Cemetery was the infant son of James H. “Whispering” Smith in 1870. Smith was one of the largest landowners in the Buckhead community in the mid-19th century having purchased 405 acres of land (Land Lots 141 and 142) from Clark Howell around 1860. His land was in the vicinity of the present day Governor’s Mansion. According to Civil War era maps, Smith’s house sat near the intersection of Paces Ferry Road and old Howell’s Mill Road, now Arden Road. When Smith died in 1872, he was also buried at the cemetery. 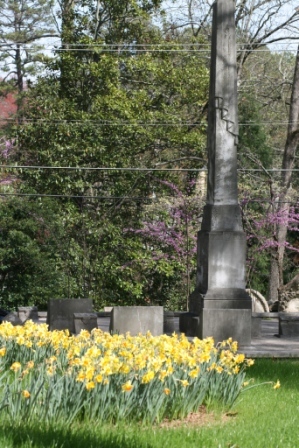 The first documented reference to the cemetery is in an 1889 deed from Wiley Rice, a wealthy Buckhead farmer, conveying property to Harmony Grove Congregational Church for “church and burial purposes.” The Congregational Church likely stood on the highest part of the site facing West Paces Ferry Road. In 1903 the church was sold and became Harmony Grove Baptist Church; it wasn’t long, however, before the congregation dwindled away. John N. Sims then bought the church and property. Sims ran a drug store in Buckhead and was the father of future Atlanta mayor Walter A. Sims. John Sims died in 1919; a tall obelisk marks the Sims family plot in the middle of the cemetery. It was likely during the early 1920s when the church was torn down, a time when the surrounding residential neighborhoods were being developed. In 2007, an archaeological investigation determined the existence of 171 total graves at Harmony Grove, including many that are unmarked or crudely marked. Franklin Garrett’s necrology of the cemetery in 1930 only documented 41 graves. 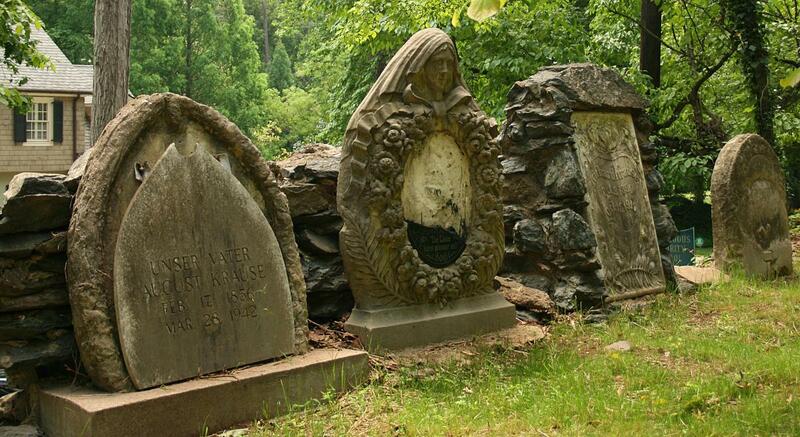 Find A Grave has 56 interments documented. Most of those that are unmarked or marked by simple fieldstones are located in the southern portion of the cemetery. While conducting their work, archaeologists found many artifacts including pottery, broken bottles and metal dishes in the southern portion of the site. At the turn of the century, it was common for African Americans to throw broken crockery, glassware, kitchen utensils and other kitchen articles onto the graves of the deceased. The archaeologists concluded that African Americans – – possibly slaves – – are buried at Harmony Grove. Based upon the documented burial death dates, the peak period of burial was the early 1900s, primarily between 1910 and 1940. Just one of those burials was Elford Smith, who had served as a private in the South Carolina Volunteer Infantry during the Civil War. After the war, Elford moved to Atlanta, where he worked as a carpenter and laborer. He entered the Fulton County Soldier’s Home on September 15, 1916; he died just seven days later. The cemetery’s last burial was Charlotte Krause, the daughter of German immigrant stone carver August Krause (also buried in Harmony Grove), in 1982. Franklin Garrett’s Necrology for Harmony Grove, cemetery records roll 1, accessed at the Atlanta History Center in July 2015. Harmony Grove walking tour developed by Buckhead Heritage, 2012.